The Chicago Freedom Movement: Then And Now Martin Luther King Jr. fought racism and housing discrimination during the Chicago Freedom Movement. With member station WBEZ, Michel Martin explores the movement's impact 50 years later. In 1966, Martin Luther King Jr. traveled to Chicago with a mission to expand the Civil Rights Movement from the South to the North. King led what became known as the Chicago Freedom Movement, focusing on racial discrimination in housing as well as discriminatory practices by employers. 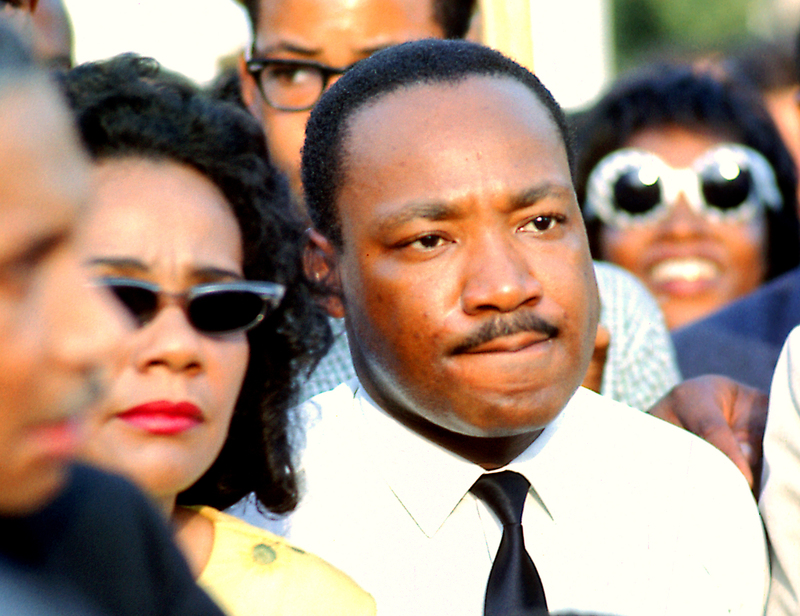 Fifty years later, does King's work still impact the communities he worked to protect and create a better future for? I'm in Chicago, leading a discussion that reflects on King's time in the city. The conversation features community members who experienced the the Chicago Freedom Movement firsthand, and a new generation of activists who are all too familiar with what fighting for civil rights looks like today. In collaboration with member station WBEZ, Going There: The Chicago Freedom Movement: Then and Now will be a night of compelling conversation and live performances. Martin Luther King Jr. and Coretta Scott King at a rally in Chicago's Grant Park in 1966. See some of WBEZ's 50th anniversary coverage of the Chicago Freedom Movement here. You can tune in to the live event on this page or via NPR Extra on Facebook. We're also taking the conversation to social media with a Twitter chat using the hashtag #NPRChicagoFreedom. Bella Bahhs, @BellaBahhs, is the co-director of the #LetUsBreathe Collective, and is a raptivist, organizer and public commentator working to deconstruct systemic injustice in America and worldwide through art. Eve Ewing, @eveewing, is a sociologist of education whose research is focused on racism, social inequality, and urban policy, and the impact of these forces on American public schools and the lives of young people. Evan Moore, @evanFmoore, is a Chicago-based journalist who writes about sports, crime, violence and politics. His work has been featured in Ebony, Chicago Magazine, DNAinfo, The Shadow League, The Athletic, RedEye, Crain's Chicago Business and Community Media Workshop's We Are Not Alone/No Estamos Solos Project on Youth Violence. Martin V. Torres, @MartinVTorres, is the associate director of the Latino Policy Forum in Illinois and guides legislative and administrative advocacy with a focus on early childhood education, immigrant integration, housing and state fiscal policy. Gabrielle Wright, @GabiAWright, is part of the WBEZ team in Chicago. Before joining WBEZ in her current role as digital producer, she interned with Curious City and the Brian Lehrer Show at WNYC Radio. Her interests include the intersection of performance and civic engagement, oral history and theater. Jack Macnamara is a visiting scholar at the Center for Urban Research and Learning at Loyola University Chicago. Beryl Satter is a professor and author of Family Properties: How the Struggle Over Race and Real Estate Transformed Chicago and Urban America. Tania Unzueta is the co-founder and organizer of Chicago's Immigrant Youth Justice League, an organization focused on immigrant rights.